Performative actions find their true nature in the interaction between performer and audience. Performance replaces the “cerebral” relationship between actor, character and viewer with the psychophysical interaction occurring between performer and audience. As a result of action strategies and behaviours, performer and spectator are subjected to a transformation. This change can be emotional, physical, voluntary or not. Performance symbolically shows what life is, without a univocal statement. In fact, the relationship between spectator and performer is subjected to personal interpretations, which cannot be separated. Each of us in front of a naked, covered, injured body will have our own interpretation/reaction, which in turn depends our human and cultural experiences of the individual. Performance is essentially based on what occurs within the performative space: the performer’s action and re-action of the audience. These observations are the starting point for an understanding of Il corpo chiede by Virginia Zanetti, performance presented on 2nd February for PIECE – percorsi della performance festival, curated by Peter Gagliano and with Giancarlo Cauteruccio as artistic director. Il corpo chiede is a further research conducted by the artist about the ‘non-dual’ relationship, and the cohesion between the Self and the Other. Through physical action, mainly focused on the interaction with the viewer, performers breaks down boundaries between the artist and the audience in the so-called “traditional’ theatre to undertake the active activity of sharing and merging with the Other. During the evening, the video ‘Studio primo per l’estasi nel paesaggio/ Dispositivo a terra’, was also shown which directly precedes Il corpo chiede and provides a possible interpretative key. The video features the artist using a sculptural material to ‘register’ its attempt to merge with the earth. The clay is cut into blocks, as people used to do to enclose the archaic cosmology. The boards become a means of contact between the artist’s body and the earth, between subject and object of experience. How did you arrive to this performance? Il corpo chiede follows Studio primo per l’estasi nel paesaggio/ Dispositivo a terra and is part of a series of works that attempt to delve into the concept of non-duality: the fusion of the Self with the Other. In Studio primo per l’estasi I experienced the attempt to merge my own body with the earth. 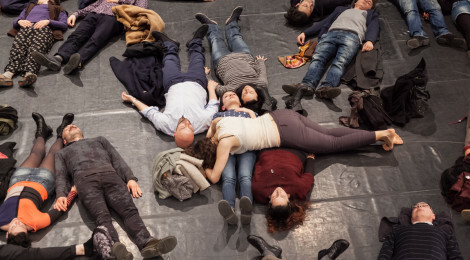 During the action Il corpo chiede, the theatre has become a sort of active landscape where I experienced the endless process of mutual dependence between audience and artist, both of which are ‘means’ to explicit awareness. By executing a role reversal, the identity of the theatre has been transformed: people were driven directly into the scene and have become protagonists, living and creative material, artwork themselves. 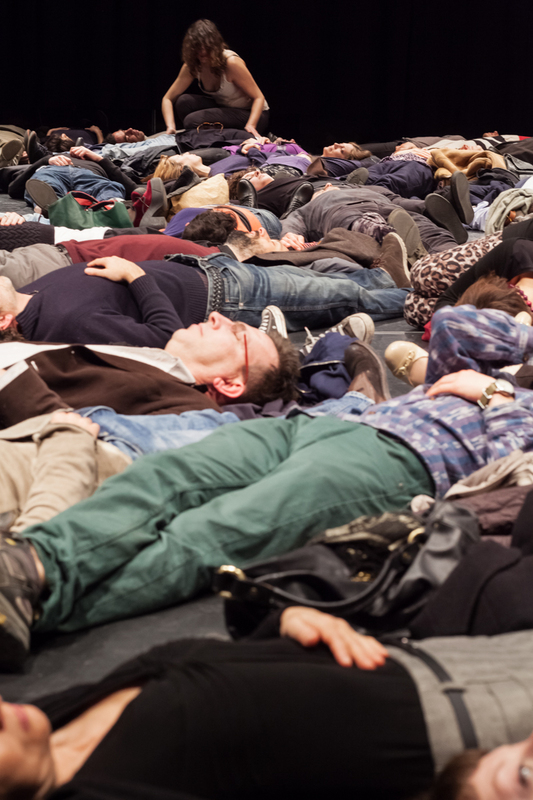 The action has embraced people, as they are, who have been physically moved around and laid down on the stage. An intense shared experience was born by feeling, looking, driving, joining, touching each other for few hours. It was a transition, both in the sense of emotions transfer and in the etymological sense of “carrying”. The final image of the bodies had its own aesthetic and emotional autonomy, stemmed from the relations between the audience and myself. How long have you been working on performances in which the audience is an active part of the action? My work began as a research about relationships: first with myself and then with what is outside. This is understood as a resource to identify and break down boundaries between people, between my work and the spectator. Each action is the result of an intensive dialogue between inner and outer, between the environment and myself. This dialogue was naturally born as an integral part of the landscape (which includes people) with the function as a collector of human dynamics, rather than as a mere object of contemplation. I do believe that there is no difference between material and immaterial object (performance): it is always a cause, which needs the Other to produce an effect. In the words of Jacques Rancière: “there is no theatre without spectator”, the latter is no longer relegated to a passive role with no action, but becomes an active part in the process of knowledge. What do you think about that? The transition from being passive to gaining an active role in the world is a principle that should be applied to all human beings. I think it is the greatest opportunity of political and social revolution. There is no identity without the Other. The big changes are in the language and tools of communication that, in line with the content, emphasize and facilitate the understanding of the functioning of life. Each discipline has arrived to this stage via different routes, especially the discoveries of quantum physics, the web 2.0 and up to robotics, which manages to mechanize thoughts through electrical impulses of the brain. In this context, the only possible way is to take an active role with the others. The deconstruction of the boundaries between viewer and artist leads the latter to take into account an additional element: the “unforeseen.” How do you face to the contingency that affects the action? I am open to the vertigo of the unknown, accepting the possibility of error that often becomes the main source of my creative work. The same applies to my limits, I try to use everything negative inside and outside myself, to indulge the part of my self that is not educated, uncivilized, bring out the madness, tears, laughter, and then to use all this in the creation of a work that is the opposite. Features such as simplicity, humanity, spontaneity, ease, and freedom shape my work. They are often the result of a transformation process of opposing elements with which I confront the every day. The purpose that supports an action is very important, especially when this involves others. It needs a lot of both physical and spiritual preparation. Il corpo chiede initially had neither duration nor participants; it was only myself there with my intention. I was not able to provide a clear explanation to anyone. Part of the work is to be trusted by the people I work with and make sure that they rely on my “crazy” way of working: constantly changing and seemingly random. What is the common thread that links your performances? The common feature of my work is the attempt to understand the functioning of life and relationships that support it, starting from the experimentation of non-duality between phenomena and forces. Every work buds from the previous one, spontaneously, seemingly randomly. But as they are all linked within a network of mutual relations, nothing is random. In general I try to open myself to the history of the territory that I visit, trying to pick up memories, thoughts, dreams of its inhabitants. In my performative works participants are invited to perform “impossible” exercises in order to confront themselves with their own limitations, and find in them an impetus towards diversity. Dialogues often feed my works. Conflicting and lively testimonies (physically collected or through written texts) culminate in collective performances or environmental installations. Through a role reversal, I try to give back to the artistic gesture its sense of research and communication, outside the logic of the market, but within the dynamics that determine it.